Fashionistas already know that 1940s glamour is back in style. The lady-like silhouette emphasized for fall and winter 2013 was inspired by Christian Dior’s New Look collection in 1947. It was a return to femininity that had disappeared earlier that decade when war shortages resulted in austere-looking women’s attire: slim, short skirts, padded shoulders, and few buttons and other trimmings. Dior’s collection, in contrast, featured soft, rounded shoulders, slim waists, mid-calf puffed skirts over multiple crinolines, tight bodices, and plunging necklines. Today’s designers have re-interpreted his look with tailored clothes that emphasize the female form, but with considerably less fabric. Waist-hugging jackets are in, but full skirts have mostly been replaced by flared or pencil skirts, and fitted sheath dresses that fall below the knee or longer. Glamorous clothes call for glamorous accessories. 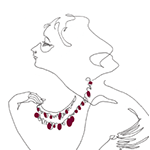 I’ve selected several gorgeous pieces of vintage costume jewelry from the TruFaux Jewels website that fit the bill and built three outfits around the jewels. Here are three looks that celebrate today’s 1940s Glam style. The jewels are all emerald, the color of 2013, and are combined with clothing in colors you might not think about putting together. I hope you find these choices inspiring. 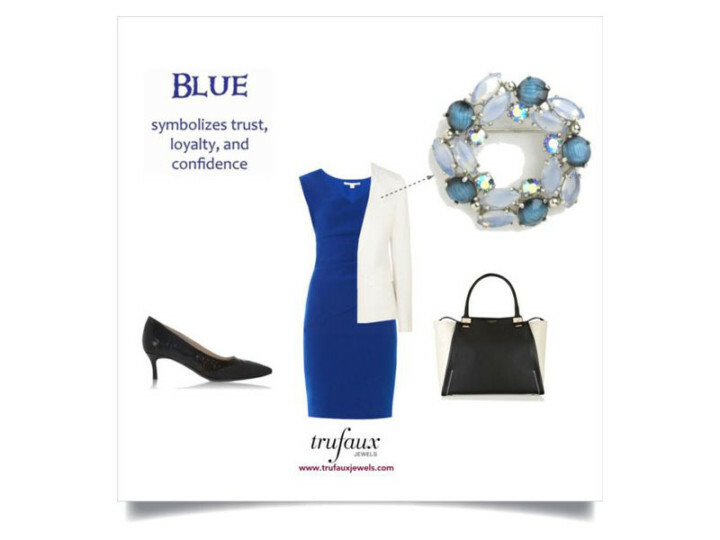 This color combination was inspired by an outfit a woman wore at last month’s Toronto Vintage Clothing Show. As soon as I saw her dark green top with a dark brown skirt, I immediately thought of this fabulous Emerald, Sapphire & Golden Topaz 1950s Brooch & Earrings Set by Hattie Carnegie. The deep emerald green, teal blue, and amber stones shimmer in the light. During the day, wear this brooch below the shoulder of this fitted sheath, and then use it to hold the shawl in place around your shoulders as you step out on the town. The earrings are clip-backs, so women with or without pierced ears can wear them. This set is from the late 1950s but is timeless, as are the T-strap pumps in a snakeskin print that combines the brown and green. The boxy handbag completes the look. This fitted, black belted jacket is paired with a black, blue, and green paisley fluted skirt, both style staples for today’s 1940s trend. 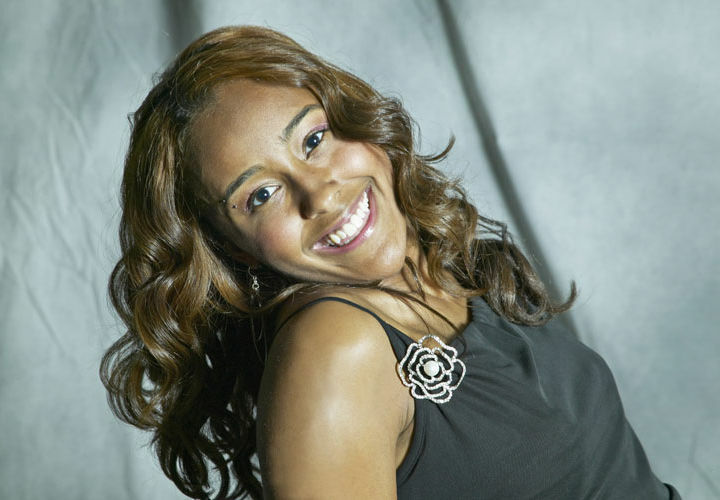 I chose emerald accessories to emphasize the green in the skirt pattern. Although the bracelet and earrings with emerald rhinestones are both from the Art Deco era, their glamour and classic style are perfect for this outfit. In fact, you could substitute this Emerald, Diamanté & Sterling Art Deco Line Bracelet for the 1950s bracelet in the outfit below. How about substituting a navy sheath for your little black dress this holiday season? And what could be more lady-like than this one, with its asymmetric shoulder strap, structured bodice and slim skirt. I’ve added a navy pashmina and navy suede platform, peep-toe heels along with a floral brocade evening bag that picks up the blue and green, one of my favorite color combinations. These Emerald & Diamanté Sunburst Earrings by Hattie Carnegie and Emerald Chaton & Diamanté Bracelet add just the right amount of sparkle to this outfit to be called glamorous. 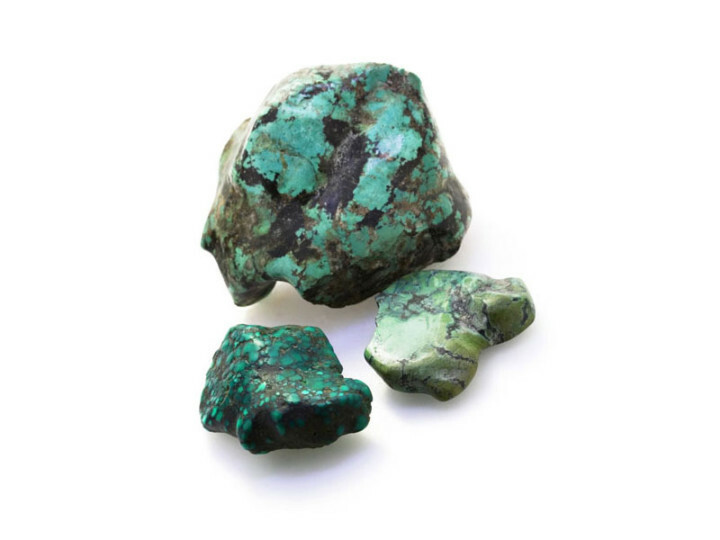 Click through to see additional emerald pieces on the TruFaux Jewels website. 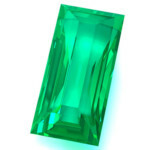 For more information about the color and the gemstone, read my blog post Emerald: The Color of 2013.